We found the Fitbit Charge 2 Heart Rate and Fitness Tracking Wristband cheapest at John Lewis (£119.99 including free delivery). This is not a sponsored post. When a friend came over to visit with his children, we took them to the park and walked there and back. Back home I went to pour some wine. At that point he told me we’d walked over 2000 steps and burned off more than 200 calories during our little trip. I’d definitely earned that glass of wine! He knew this as he had a Fitbit. I was hooked. I’m not sporty and I’ve never been a member of a gym. Come the evening, when the kids are in bed, I just want to relax and veg out. However, I do like walking. Not yomping, but rather going for walks with the family. I’ll always walk somewhere local as opposed to getting in the car. I’m also quite competitive and a bit of a fidget. 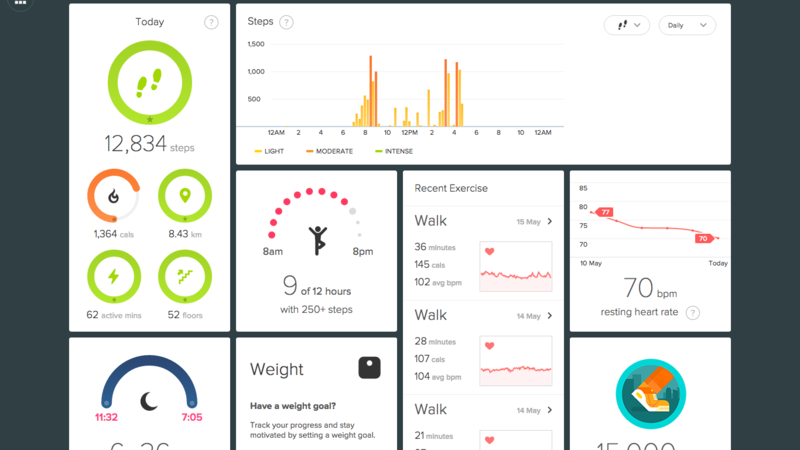 That evening I downloaded an app called Stepz – a simple pedometer and step counter – from iTunes. The only problem was, as much as I am addicted to my phone, I wasn’t actually carrying it around every single second. It was a good rough guide but I wasn’t properly counting my steps. My husband seeing my unprecedented enthusiasm for something exercise-related ordered me a Fitbit. What a lovely thing to do! Or was he perhaps hoping it might help cut down on our weekly wine expenditure..? He went for the Fitbit Charge 2 Heart Rate and Fitness Tracking Wristband and found it cheapest at John Lewis. It is so easy to set up, the instructions are clear and a minimal profile is all you need to get going. You can see a lot of the information on the wristband itself (which also displays date, time and text messages), but downloading the app means you can really drill down into the data if you’re that way inclined. This is A LOT more than a pedometer, but my focus over the five days I’ve had it has been this. The daily suggested target to hit is 10,000 steps. The morning rush to make all the beds, get three children breakfasted and ready for school and the school run itself means that I clock up a lot of steps in a short period of time. By just after 9am I’ll usually have made almost 5,000 steps. The school run in the afternoon adds another couple of thousand. That means I’m almost guaranteed to hit 10,000 each day during the week. However, my problem lies in the fact that I work from home sat at a laptop, so have many hours of being very inactive. Now this is where the Fitbit is really starting to shape my routine. 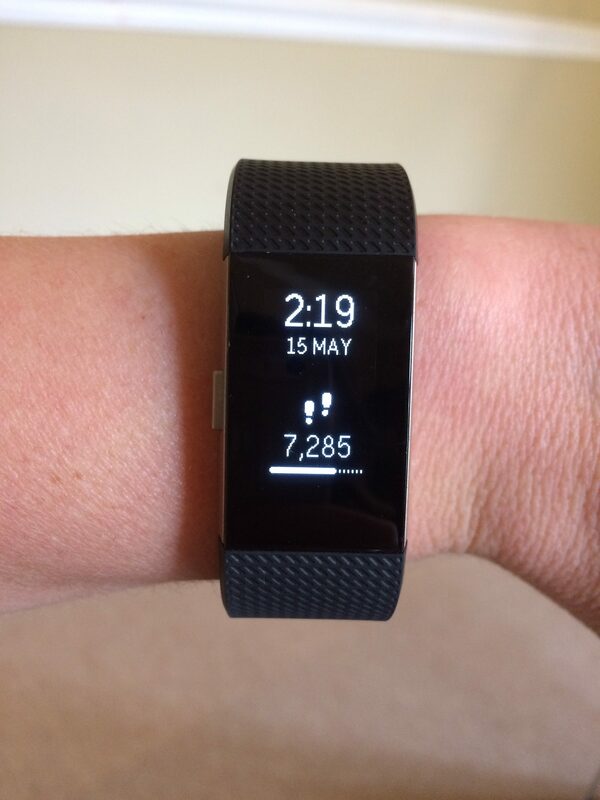 One of the features is the 250+ steps per hour. You can set this for as many hours as you want; I’ve got it for 12 hours. I’m sedentary from 9am-3pm, so in this period it’s very difficult to make 250 steps each hour. The Fitbit alerts you 10 minutes before the hour is up if you haven’t made your 250. This has actually made me step away from my desk and have a sudden burst. I’ll go and get the washing out of the machine, quickly go and tidy stuff in the playroom and make up the rest with a few ‘runs’ up an down the stairs. I can’t possibly let the hour slip by without hitting the target! It really doesn’t take long to get that 250. I’d never have dreamt of getting up and having a little sprint around the house previously. It means I actually get my heart rate up, something that doesn’t happen on the school runs and general walking. It’s already starting to change my actions in a positive way. I won’t take the shortcut or cut corners, I’ll just go the normal route but try and do it marginally quicker. I certainly won’t take the lift if I can use the stairs. I’m making little tweaks like leaving a couple of minutes later for the school run so that I’m forced to walk that little bit quicker. I’ve found my exercise nirvana: something that doesn’t seem like exercise at all. 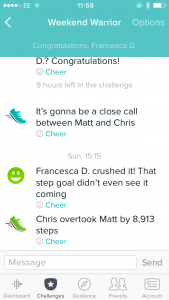 Another great feature is that you can synch up with any of your friends who have a Fitbit and go head-to-head. You can compare your step total with your friends at any time, and this is based on a seven day total. It is great motivation! I got invited to a Weekend Warrior challenge. This is more competitive than day-to-day comparisons. It tallies up your steps over the 48 hours of the weekend and pings you with progress reports and words of encouragement during the period or when there’s been a change of ranking. It keeps the momentum going and really helps with the general lull in activity you get at a weekend. I’ve begun to look at things like my resting BPM to see if/how that improves. I’ve even had a go at ‘relaxing’ with its deep breathing exercises. I’ve just started looking at the sleep aspect of the app. You can wear your Fitbit to bed and it analyses how much awake time, REM, light sleep and deep sleep you get a night. Surprise, surprise I don’t get enough sleep. I’ve now been set a target. I’ll keep you posted on that. Oh, and by the way, did you know you burn calories whilst sleeping? I haven’t familiarised myself with the rest of the functionality yet as at the moment I’m really enjoying what I’m doing, but I will. There’s even something to help you increase your water intake. I drink about a glass a day, which is terrible. Completely agree with your experience. Especially nice waking up knowing I’ve already burned calories!